All of the following is from the booklet "Centenary History of The Salem Presbyterian Church, Venedocia Ohio. September 3, 4, and 5, 1948. Gerald R. Johnson minister and moderator." I (Charles Good) have added a few parenthetical comments. The first church was built in 1853. It was a framed building measuring 20 by 30 feet. The cost was $300. It was located across the street from the present church. The carpenter was Mr. Edward J. Jones, assisted by Mr. D. M. Jones. On the day of its opening the Rev. Robert Williams and the Rev. Evan S. Jones of Jackson presided. The second church was built in 1866 under the pastorate of the Rev. J. P. Morgan. It was built where our present church now stands. The contractor was Mr. William E. Jones, and the cost was $3500. This church is at present the Cambrian Hall. It was purchased in 1897 by the Venedocia Male Chorus for one hundred dollars and moved to its present location. The two ministers who served at the opening were the Rev Thomas Levi, a well known minister of Wales, and the Rev. Howell Powell of Paddy's Run. In 1897 the Rev. Edward Roberts and the congregation felt that the community was worthy of a more modern church. When the proposition was placed before the congregation, $5000 was pledged. This showed the desire of the congregation to provide a better house in which to worship. Two weeks later, at another meeting, $5000 was again pledged, making the total $10000. No definite amount was assigned to individual members, but each gave of his own free will. An additional $4000 was given on the day of dedication. The following were selected as the building committee: Rev Edward Roberts, president; Mr. Thomas A. Alban, vice president; Mr. John C. George, secretary; Mr. Maurice B. Jones, treasurer; and Messers William E. Jones, /Edward Hughes, John S. Breese, William J. Bebb, John W. Jones, David T. Jones, John H. Reese, Richard M. Evans, David B. Jones, J. Pryse Morgan, William C. Morgan, Richard O. Evans, and Dr. David Davis. The committee met on August 23, 1897, and decided to have an architect. On November 18, 1897 the committee accepted the plans of Wing and Mahurin of Fort Wayne, Indiana. Bids were received from six different firms but the committee accepted J. S. Zook of Van Wert, Ohio as the contractor, at a price of $11149.57. He was the lowest bidder and $5000 under the highest bidder. This church required wider space than the former church, so an extra strip of land twenty-seven feet wide was purchased from Mr. D. W. Evans. Mr. Zook completed the church in the time given, and proved himself Christian and a competent contractor. The dedication of the new church took place on October 15-16 1898. Ministers taking part on the first night were the Reverends Edward Roberts, J. P. Morgan, and Daniel Evans Jones of Venedocia; H. W. Griffith of Cincinnati, Ohio; William W. Reese; R.H. Evans of Cambria, Wisconsin; Dr. David Davis of Oshkosh, Wisconsin; and Dr. William James of Manchester, England. The windows of the church were given as memorials. The front window to the east was given in memory of the first three Welsh families. THE ELDERS OF SALEM CHURCH: Willaim Bebb, Thomas Morris, Jeremiah Parry, Evan Thomas, William G. Bebb, David M. Jones, Abraham Jones, Rowland J. Whittington, Thomas A. Alban, David W. Evans, Morgan H. Morgan, John T. Thomas, Thomas J. Morris, Richard Jervis, J.Pryse Morgan, John D. Jones, Abraham B.Jones, John C. George, Richard S. Breese, Maurice B. Jones, David O. Davies, Charles H. Foster, Henry Uhl, Edward W. Williams, David J. Morris, Lloyd Rees, John L. Jenkins, Stanley Roberts, Thomas Jones, Bowen Evans, Howell A. Jones, Robert F. Evans, John Mills Richards, Rowland Evans, John E. Morgan, Maurice N. George, J. Laton Jenkins. The first manse was built in 1885 for the Rev. Hugh Davis. This house is still standing, directly south of the Cambrian Hall. The second manse (still in use immediately south of the church-- Charles Good) was built in 1900, during the ministry of the Rev. Edward Roberts. Prior to 1885 there had been no religious services held in the English language in Venedocia. At this time, however, a number of English-speaking families had located in the village. There was Mr. Henry Dorman, employed by Williams Brothers, who operated a general store; Mr. Marcus Allison, a section foreman on the railroad; Mr. Henry Marsh, a carpenter; Mr. David Knox, a carpenter; Mr. James Davis, the village blacksmith; and Mr. James Reed, a manufacturer of axe handles. These men, with their English-speaking families, and some others felt the need of some kind of religous services. A sunday School was organized, and it met in a small brick school house which stood near the present parking lot across from the Salem Church. Mr. Henry Mash was chosen superintendent. This Sunday School met regularly for some months until several members, with their families, moved from the village. The Sunday School was then abandoned. No other English religious services were held in Venedocia until 1895. In the early months of that year, through the efforts of Mr. J. J. Edwards, another English Sunday School was organized, with Mr. Edwards as superintendent. This school held its meetings in the old Cambrian Hall, which was located on the second floor of the Williams Brothers' store. This Sunday School was well attended and the enrollment was relatively large. Mr. J. J. Edwards was not an ordained minister at that time, but at the insistence of some of the older members of the Sunday School he consented to give Bible talks at the close of the Sunday School session. This procedure made many of the members of the Sunday School feel the need for an organized church. In the closing months of 1895 the Venedocia Presbyterian Church was organized, with the Rev. D. Evans Jones as pastor. Three elders were elected; they were: Messers. J.C. Morris, E. S. Foster, and T. S. Morgan. The newly organized church had thirteen members: Mr. and Mrs. E. S. Foster, and their children, Lizzie, Daisy, Charles, and Homer; Mr. and Mrs. J. J. Edwards; and Mr. John Rees (Cleveland). John Rees was the first treasurer and T. S. Morgan was the first clerk of session. The church did not have its own chorister, and so John Foster came and led the singing. The organists were: Mrs. Kate Uhl Davies, Mrs. Pearl Foster Olafson, Mrs. Bertha Evans Uhl, Mrs. Hattie Blosser Wise, and Miss Elizabeth Uhl. When the church was first organized, services were held on the second floor of the school house, which stood near the present Venedocia Recreation Field. The first church building was erected in 1896, and in 1911 the church was redecorated. In the year 1911 Messers. Henry Uhl, C.H. Foster, and D. C. Morris were elected elders. In 1913 the Rev. Daniel Evans Jones resigned as pastor and moved to Cambria, Wisconsin. In March of 1914, the Rev. William Surdival became the pastor of the church. On February 11, 1916, fire borke out, and the church was burned to the ground. The church was never rebuilt. For a while services were held in the hall above the store, and in the Salem Church on Sunday afternoons. In 1918 the members of the Venedocia Presbyterian Church united with the Salem Church. The arrival in this section of Van Wert County, in the spring of 1850, of four Welsh families from Cincinnati, Ohio, marked the beginning of the Zion community. This group, consisting of Abraham Jones, Hugh F. Jones, Thomas Hughes, and Griffith Goodwin, with their families, was supplemented during the next few years by the coming of several other families from Cincinnati, Jackson, and Newark, Ohio, as well as from Wales, Great Britain. Records indicate that as early as 1854 religious services were regularly held at Abraham Jones' log house. Sunday School at first, and later, preaching services as well were held there. 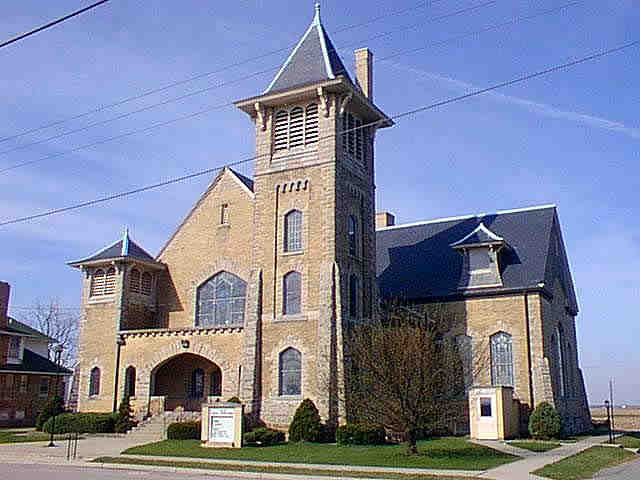 Upon the completion of the first church building in 1863, a "Union" Church was organized, consisting of both Congregational and Calvinistic Methodist elements, and named The Zion Church. In time, however, the Church became definitely affiliated with the Welsh Calvinistic Methodist denomination, and remained so until this body merged, in the year 1920, with the Presbyterian Church in the U.S.A.
From its beginning, Zion Church has been a joint pastorate with the Salem Church of Venedocia. (What is now Salem Presbyterian Church of Venedocia was originally named Salem Calvinistic Methodist Church --Charles Good.) Following are the ministers that have served as pastors: The Reverends Hugh Pugh, John P. Morgan, Hugh Davies, R. Vaughn Griffith, Thomas Roberts, Edward Roberts, R.J. Williams, William Jones, W. T. Jones, and the present pastor Gerald R. Johnson. The present church edifice was built in 1902, during the pastorate of the Rev. Edward Roberts, and was dedicated October 11-12 of that year. It remains a monument to the consecration of the God fearing and church loving families of Zion of forty years ago, as well as the faithfulness and devotion of its members today. THE ABOVE ARTICLE WAS WRITTEN BY THE REV. W. T. JONES AT THE TIME OF THE 40TH ANNIVERSARY OF THE ZION CHURCH. A Sunday School and a Prayer Meeting were organized in the Horeb community on June 24, 1864. The first Sunday School was held in the Daniel Jones' home, which was located where the Horeb Cemetary is now located. In May 1865, it was decided that the present house was too small. Daniel Jones donated one acre of ground on which was erected a log church, 20 by 28 feet. The Rev. J. P. Morgan, pastor of the Salem Church, would come occasionally to preach and conduct services on Sunday evenings. In 1873 a new frame church was erected. This church measured 30 by 40 feet and it cost $1800. The membership was in the Salem Church until June 15, 1881, when the Horeb Church was declared by Presbytery to be an independent organization, with M. H. Morgan as elder. The church membership at this time was fifty three. The first pastor was the Rev. Isaac Edwards, who served from June 11, 1882 to April 13, 1887. He was followed by the Rev. D. Jewett Davies, who served from December 23, 1887 to December 20, 1891. May 1, 1893 the Rev. Isaac Edwards returned to Horeb Church as pastor and served until his death on June 3, 1898. The Rev. David M. Jones was then called and served from Novenber 24, 1898 to January 1907. During his pastorate a new brick church was erected; this church was dedicated in June 1905. The Rev. Daniel Evans Jones had charge of the church for one year, beginning april 15, 1907. He preached on Sunday afternoons. Then the Rev. W. Trevor Williams was called. He began his pastorate june 20, 1909 and served until September 1918. In 1920 the Horeb church united with the Salem Church. These missionaries went out from the Horeb Church. Mr. and Mrs. Rees F. Edwards went to China; and Miss Alice Jones went to India. From the membership of the church came also three ministers: the Rev. D. Luther Edwards, the Rev. Joseph Richards, and the Rev. John Lloyd. 1854-1865 The Rev. Hugh Pugh canme as the first minister. He served very faithfully for eleven years. He went from here to Sugar Creek, Putnam County, Ohio. He died August 12, 1878. 1865-1882 The Rev. J. P. Morgan of Jackson county came to minister and served here for seventeen years. He retired because of ill health. 1885-1886 The Rev. Hugh Davis came from Wilkesbarre, Pennsylvania. He remained here just one year and then returned to his former church. 1886-1889 The Rev. Vaughn Griffith came in the fall of 1886 and remained until 1889. he went from here to Lime Springs, Iowa. 1890-1895 The Rev. Thomas Roberts came in the spring of 1890. He remained here until the spring of 1895 when he returned to England. 1895-1913 Edward Roberts. He was born in Llidiardan, North Wales, on May 19, 1858. He studied in Princeton Theological Seminary from 1882 to 1884. He was ordained by the Welsh Presbytery, Synod of New York and Vermont on June 5 1884. He served as pastor of the Welsh Church at Middle Granville and Granville, New York from 1884 to 1895, and as pastor of the Salem and Zion Presbyterian Churches of Venedocia Ohio from 1895 to 1913. He is buried in the Venedocia Cemetary. 1914-1922 Richard J. Williams. He was born in Deiniolen North Wales, June 13, 1881. He was graduated from Hamilton College in 1909, and in 1917 he received his M.A. degree from the same school. On June 14, 1948 Hamilton College awarded him the honorary degree of Doctor of Divinity. He served as pastor of the Jerusalem and Bethesda Churches, Wales, Wisconsin from 1909 to 1914. In September 1914 he bacame pastor of the Salem and Zion Churches of Venedocia. In 1922 he bacame pastor of the Ebenezer Welsh Presbyterian Church, Scranton Pennsylvania. 1923-1931 William Jones. he was born in Wales, Great Britain, July 3, 1871. He attended Trefecca College, and in 1900 he was ordained. He served his first pastorate in the Welsh Calvinistic Methodist Church in Caerphilly. His next pastorate was in Rhymney. In February, 1911, he and his family left the British isles and came to the United States. He served as pastor of the church in Midland, South Dakota, from 1911 to 1912; Lime Springs, Iowa from 1912 to 1913; Crawfordsville, Iowa from 1913 to 1918; and Garden Grove Iowa from 1918 to 1922. He became pastor of the Salem and Zion Presbyterian Churches of Venedocia in 1923 and served here until his retirement in 1931. 1935-1942 William T. Jones. He was born in Wales, Great Britain, and came to the United States in 1926, at the age of 18. He received his B.A. degree from Carroll College, Waukesha, Wisconsin, in 1933; he received his B.D. degree from McCormick Theological Seminary in 1936. During the time he was in seminary, he did post graduate work at the University of Chicago. During his last year in seminary, from June 1935 to june 1936, he supplied the pulpits of the Salem and Zion Presbyterian Churches of Venedocia. He was installed as pastor in June 1936. He served Salem and Zion churches until October 1942, at which time he became pastor of the Emerald Avenue Presbyterian Church, Chicago, Illinois. 1943- Gerald R. Johnson. He was born in Escanaba, Michigan. He attended Alma College, Alma, Michigan, and The College of Wooster, Wooster, Ohuio, from which he received his B.A. degree in 1940. he received his TH B. degree from Princeton Theological Seminary, Princeton, New jersey, which he attended from 1940 to 1943. In June 1943 he became pastor of the Salem and Zion Presbyterian Churches, Venedocia Ohio. All of the following is quoted from a booklet entitled SALEM UNITED PRESBYTERIAN CHURCH, VENEDOCIA, OHIO 1948-1973. FORWARD: One Hundred twenty five years ago in April of 1848 the first Welsh Church meeting was held in Van Wert County with twelve people making up the first membership of the Salem Church. 1949-1950 William G. Chalmers D.D. He was born March 8, 1922 in Hamilton Ohio. In 1944 he graduated from Los Angeles Bible Theological Seminary with a B.Th degree. He received his B.A. degree in 1946 from Whitworth College, Spokane, Washington. In 1949 he received his Master's degree from Princeton University. Schillen College, Kleiningersheim, Germany awarded him an L.H.D. honory degree in 1967. And in 1968 Whitworth College awarded him the honorary degree of Doctor of Divinity. He served as pastor of the Salem-Zion Churches in 1949-1950. 1951-1962 Ellis Lloyd. He was born July 11, 1893 in Penycae, North Wales. He received his education in Wales. His first call to the ministry was to Montreal, Canada. he also served pastorates in Nanticoke, Pennsylvania; New York Mills, New York; and Cleveland, Ohio. He served the Salem-Zion churches Venedocia Ohio from 1951-1962 at which time he retired. The Rev. Lloyd passed away August 13, 1967. 1963-1968 James G. Patterson. He was born July 5, 1924 in Walton New York. He attended Union College toward a B.S. degree in physics, leaving after two ahnd one half years to serve two years in the U.S. Navy as ETM s/c in Electronics. In 1948 he graduated from Muskingum College with a B.S. degree in Chemistry. From Pittsburgh-Xenia Seminary in 1951 he received his B.D. degree in chemistry. From the same College he received his Th.M. degree in 1955. He has held pastorates in new Alexandria, Pennsylvania, 1951-1955; Bellefontaine, Ohio 1955-1963; Salem-Zion Churches, Venedocia Ohio, 1963-1968 and The Federated Church, Waterford New York. 1969-1973 George W. Witmer. He was born in Oil city Pennsylvania, February 27, 1929. His undergraduate work was completed at youngstown State university, graduating in 1962 with a B.A. degree. He attended Louisville Presbyterian Theological Seminary 1962-1964. In 1967 he received his Master Divinity degree from Anderson Graduate School of Theology. He was ordained into the Christian ministry on February 28, 1968 at Servia, Indiana. Mr. Witmer began his ministry with the Salem-Zion Churches in Venedocia, Ohio June 13, 1969 and served these Churches until May 31, 1973.